The other day I was driving home from the coffee shop on lunch break. “How’s My Driving?”, was staring me right in the face in bold black letters on a yellow background. Chances are you’ve seen one of these stare you down too. A recourse to penalize bad drivers representing the company, or praise those who are doing a great job. The funny thing is, I was behind that vehicle for a good 2 minutes waiting for the light to change so I could get home. Had that driver done something that warranted me calling the company driver hotline, however, I’d be at a loss. You see, the phone number, was a “1-800” number and didn’t spell anything catchy. The vehicle ID number? Yeah it contained 2 letters and 7 numbers. The license plate, could have read that too, but I was already looking at the phone number, which was on the edge of the bumper, not near the license plate so I could see both at the same time. See this company wanted feedback…they’d never get it from me! They’d never get it because they are making it too difficult to meet the customer where they are at. If a driver needs to be reported, odds are it’s by another person behind the wheel, who has hundreds of other things to be paying attention to than trying to type a 1800 number into their phone and then remember a 9 character ID, all while remaining in sight of the vehicle is they need any more data. You see, they wanted feedback, but were making it too difficult to give it. Many people and companies make the mistake of thinking that customer feedback is about the product. Really, the process of getting feedback is about the customer, the results of that feedback are about the product. The bumper sticker above, had it contained a phone number that was phonetically pronounceable (a phone number that spells something) and had a 4 digit ID number (instead of 9), is something the human brain can remember. They were more focused on getting feedback, than making the feedback easy to provide. One thing to remember when asking for feedback is, you are asking the responder to sacrifice their time to give it to you. It’s not free by any means. Get to the point, deliver your message quickly, and keep the length to a minimum. If the person wants to provide more feedback, give the opportunity, but do not require it. For instance, 61% of January’s 94 million users were mobile only… meaning that roughly 57 million fans only interacted with our products on a mobile device. Wild. I don’t think I can come up with a better proof to meet your customers where they are than that. I’d encourage you to go read the entire article. It’s a great read about updating a giant in the publishing world. “Explain”. My all time LEAST favorite feedback field to see. Especially when it’s ‘Required’. Being that we’ve already identified that our customer’s time is valuable, let’s not waste it with needless textareas that get in their way. Let them answer briefly, and if follow up is needed, take care of it then. A good balance between Open and Closed questions are key. Closed questions being ones that have limited and predefined answers for the user to choose from. Open questions being the big text box for them to fill in. This does not mean use ALL closed questions, just find the balance that works best for your users. 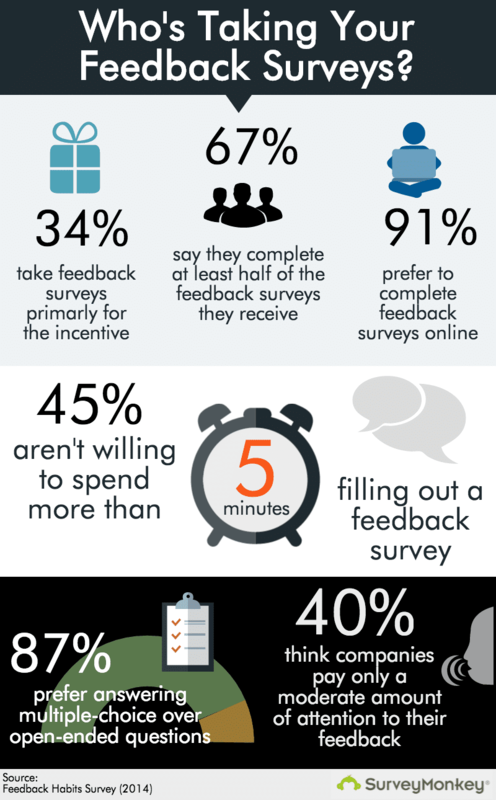 Personally, I don’t have a ton of hard numbers of where you should go, but Survey Monkey (a company dedicated to streamlining the customer feedback process), has a great infographic from 2014 that might give you some hints. Survey Monkey gives us some insight into how people treat Customer Satisfaction Surveys. What is one thing you are doing, or can do, to help encourage customer feedback and interaction?